Every goddamn day: 04/21/19: Stop thief! A monkey grabbed my iPhone. Just after I snapped the above photo, it reached out and wrapped its lithe little fingers around the brushed aluminum case. 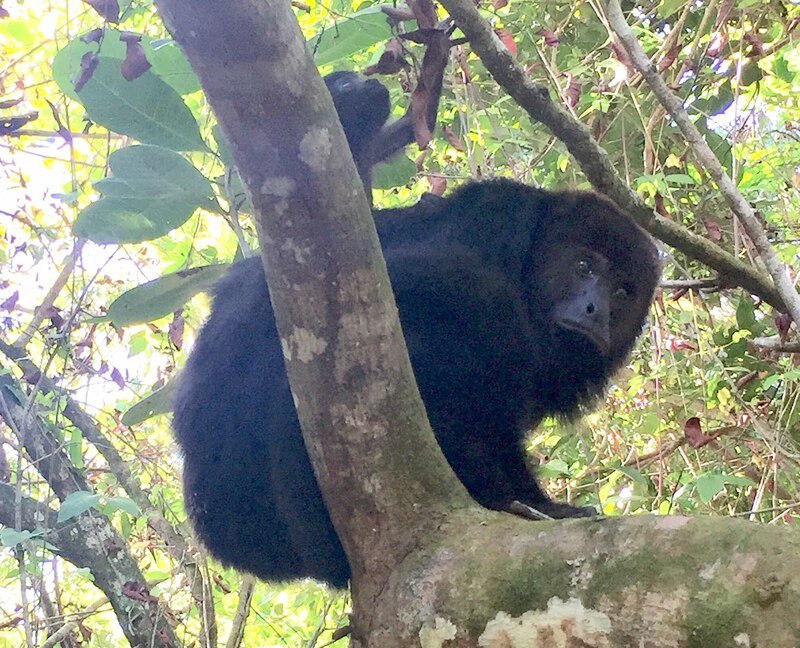 We were in Belize, at the Community Baboon Sanctuary, so named because it is run, not by the government, but by seven communities which banded together in 1985; 240 landowners agreed not to cut down trees that house howler monkeys. Now there are thousands of them. The sanctuary is run by a women's cooperative. The monkeys are called "baboons" in the local Creole, even though they are not what the rest of the world considers baboons. Our guide was a woman with an official-looking ID tag who approached us in the parking lot. She identified herself as "Geraldine the Jungle Queen" and escorted us to a spot just within a wood, across the street from the parking lot. A half dozen monkeys, one with a baby clinging to her dark brown fur, appeared above our heads. Geraldine instructed us to take leaves and feed them to the monkeys, which we did. 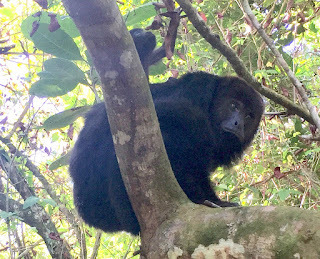 She also imitated their distinctive roar—they're called howler monkeys for a reason—and the dominant male answered back. Later, I recorded the sound at the Mayan ruin at Caracol, and you can hear it here. Geraldine was one of several guides in Belize to tell us that the howler monkey cries were used to vocalize the dinosaurs in "Jurassic Park," though a bit of digging showed that to be a slight exaggeration: howler monkey cries were used for only for one dinosaur, the Dilophosaurus, and then they were mixed with hawk screeches, rattlesnake hisses and swan calls. Most of the monkeys tentatively accepted leaves from the others in our party, but mine got down into my face. I'm not sure if it was because he identified me as strong or weak, the Alpha Male or a straggler from the herd. Maybe he just liked the phone. The monkey grabbing my phone was strong. Geraldine said that howlers are known to take a 16 gauge shotgun and bend it in half. I don't believe that—the creatures can't weigh more than 15 or 20 pounds—but the guy did have a tight grip. I must have wanted the phone more, however, and after we met eye to eye a moment, gazing at each other in mutual incomprehension across a chasm of biological time, I pulled the phone away. Relief that my iPhone wasn't being born up and away into the trees was replaced in a moment with a kind of regret. Losing the phone to a monkey would have made a better story. Imagine explaining that to the tech folks back at the Sun-Times. "I need a new phone ... because a monkey stole mine." I'd have to get a new iPhone, the 8, with its vastly improved camera. As it was mine had difficulty photographing the very dark monkeys against the light leaves, seeing their faces and small hands. 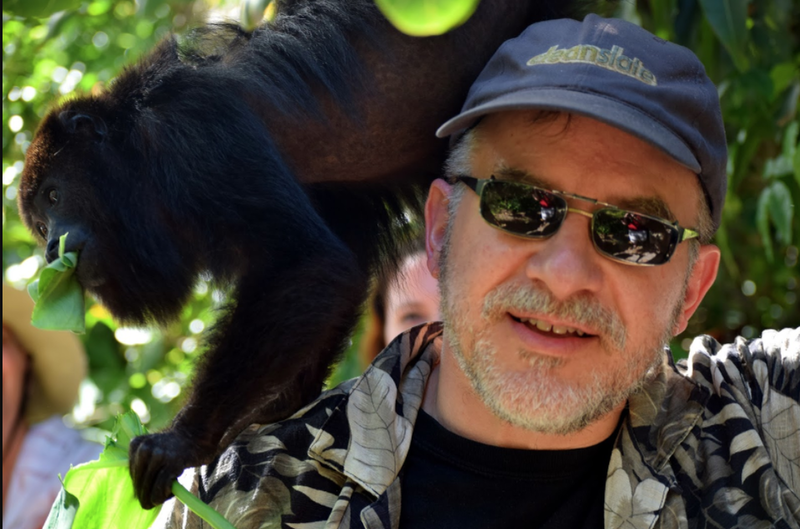 Thankfully, my older son has an actual camera, and captured me with the monkey. No doubt humans interacting with monkeys is bad for reasons that will be explained, huffily, to me very soon. But we felt thrilled and grateful to make their acquaintance. And I was relieved and sorry to still have my phone. In the scheme of things keeping the phone was a very good outcome. If the monkey had managed to grab the iPhone and take a selfie, it could bury you. "Please step out of the car and into the office, sir..."
After which, I got the good-cop bad-cop routine. They got into my mustachioed and bearded face for about half an hour. Then I was allowed back into the car.I don't recall whether or not the trunk and the interior were searched. Probably not. It was a kinder, gentler era in 1978. Haven't crossed into Canada since before 9/11. I hear getting in is not nearly as rough as trying to come back. Even if you're a U.S. citizen. And God help you if you are not. OOPS...this should have gone under the comment with the 1:20 time-stamp. I screwed up. My bad. You certainly are correct, police stops and border crossings are definitely not the time or place to have an attitude. I've had several instances of local police offering a friendly warning that a neighborhood is bad because there was a murder last year, and expect you to be frightened enough to leave the area. See, this is what happens when traveling abroad these days. I wasn't kidding when I said "tell everyone you're from Canada." I know exactly what you mean. But I've discovered saying you're from Chicago with a very slight smirk when asked, gains you all the respect you need in just about any situation. Just to be safe I think I'll order a Toronto Blue Jays cap for the next time I'm traveling abroad. I hate being ridiculed and I sure don't want to be accosted by monkeys. Or, I could just stay home for the remaining three years. It's just so embarrassing. In some of the places I've worked, if I told them a monkey took my company phone, the response would have been, "Well, maybe we should give him your job." Very funny. Glad Neil has such an erudite audience. I enjoy reading the comments here as opposed to those on Facebook or Yahoo or anywhere else. A monkey tried to make you give up your cell phone? Sounds like a Trump cabinet meeting. (Cue the rimshot).